Jonah Hill as his statistician sidekick Peter Brand. Michael Lewis is the chronicler of our age - the man who takes us inside big money, whether on the trading floors of Wall Street (LIAR'S POKER, THE BIG SHORT) or in the soccer and baseball stadiums of America (THE BLIND SIDE, MONEYBALL). Lewis is the documentarian who shows us who big money distorts ethics and produces outcomes that are inefficient, even from a financial point of view. In previous novels he took us insides world we didn't know and showed us their glamour and danger. Heck, LIAR'S POKER was as big a recruiter for Wall Street, as well, WALL STREET. The fundamental problem with MONEYBALL is that his big angle is really not that insightful. Lewis wants to tell us that when baseball managers buy players, they are distorted and prejudiced by all sorts of extraneous and irrelevant information - how good looking a player's girlfriend is an index of self-confidence is - how good he is at doing one thing when really what you're buying him for is something really different. As a result, Lewis argues that the managers systematically misprice players - overpaying for "stars" and underpaying or plain ignoring the hidden gems. Yes, that's it. That's the big idea. And for those of us who are the 1 percent, that's really not revolutionary. It's just Ben Graham's concept of value investing applied to sport. Still, even without a revolutionary idea, MONEYBALL could still have been a good underdog sports movie, of the type that DODGEBALL satirised so well. There is something genuinely romantic about failed player and down on his luck coach Billy Beane (Brad Pitt) taking his two-bit club, the Oakland Athletics, to baseball's greatest winning streak in history, and a genuine contender for the World Series. And, because he didn't have the money to outbid the Yankees for the best players, he had to do it with smarts - with a geeky kid called Peter Brand (Jonah Hill) who believed that stats could pick a holistic team of write-offs and turn them into a great and consistent squad. All this in the face of stiff competition from the conservative old guard, particularly coach Art Howe (Philip Seymour Hoffman) and the rest of the baseball fraternity. I was expecting a buddy movie - as the handsome jock and nervous geek unite against the world - an underdog movie - a David versus Goliath feelgood epic. And who cares if I don't know about baseball? I love cricket so much I can appreciate a game suffused with stats, and that chronicles the triumph of the statos over the jocks. 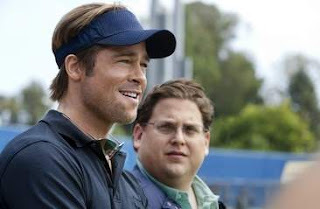 But no, MONEYBALL turns out to be an utter damp squib of a movie - unloved, uncared for, without a single voice, a single vision, or any conviction about what it's trying to do. I guess the problem is literally one of rejected parentage. Originally this was a movie that was going to be directed by Steven Soderbergh (CONTAGION) with a screenplay by Steven Zaillian (the forthcoming GIRL WITH THE DRAGON TATTOO). But then, at the last minute, Soderbergh was axed in favour of Bennett Miller, a relative unknown who hasn't done anything since 2005's CAPOTE, and the script was rewritten by Aaron Sorkin of THE SOCIAL NETWORK fame. The result is a script and a film that just never finds its groove. For the most part the dialogue is flat, and characters ill-fleshed out. There is no charismatic connection between Pitt and Hill. Pitt does that thing where he thinks he's acting if he constantly eats on screen and squints. Hill turns out to be utterly uninteresting in a straight, non-comedic role. Poor Philip Seymour Hoffman barely gets anything to do as the antagonist. We don't feel the stakes. We don't buy Pitt's apparently tragic back story. His connection with his daughter seems utterly trite. There's not enough actual gameplay. But then again, I didn't really feel like I knew what the coaches were doing or why certain moneyball tactics were working. The only flashes of wit and excitement are a couple of scenes where Beane is playing off team's against each other, and another brilliant scene in Boston - scenes that scream Sorkin and jar against the tone of the rest of the film. One can only imagine what this film might have been with Fincher and Sorkin behind the camera, and maybe Clooney and Gordon-Levitt in front of the camera. And believe me, you'll be so bored, you'll have plenty of time for such conjecture. MONEYBALL played Toronto and Tokyo 2011. It was released earlier this year in the US, India, Mexico, Russia, Panama, Iceland, Hong Kong, Lebanon, Japan, Taiwan, France, Israel, the Netherlands and Brazil. It opens this weekend in the UK and Ireland. It opens on December 2nd in Finland and Lithuania; on December 8th in Belgium, Greece, Hungary, Sweden and Turkey/ It opens on December 16th in Norway; on December 23rd in Estonia; on January 12th in Portugal; on January 27th in Italy; on February 2nd in Germany and Spain and on February 16th in Singapore.